The Free RPG Blog: Monkey Hangout #2 is coming. Your questions please! Monkey Hangout #2 is coming. Your questions please! It turns out that the 1KM1KT monkeys are not just text based figments of my imagination and that there are fully fleshed out figments of my imagination, which was a relief. The first monkey hangout was so much fun that we've decided to do another. Lots of ways to join in! It's first come first served and I think 6 places (including me) is the limit. As you can see from the video, we're all exceptionally beautiful people, so I am sure you'll fit. You will need a camera with headphones (microphone feedback is horrid without them), sign up on the thread on 1KM1KT, install the Google Plus plugin (only takes a moment) and be prepared to be answer a bunch of questions. The whole thing is streamed live, so you will be able to pop into the chat room. That's quite easy to do, get onto Google Plus, pop over to the Free RPG Blog page and you'll see a Hangout On Air with a link. Clicking that will send you through a page that you can enter text in a box! It's as easy as that. You can ask us questions and answer them too. Drop in, drop out, we don't mind - it'll be great to have you there. Do you have a question you would like the Monkeys to answer? 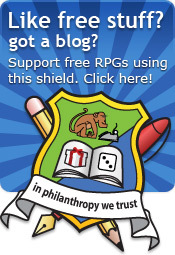 Have you got a burning thought about free RPGs you MUST have answered? Do you want to watch 6 people squirm uncomfortably at an impossibly hard question? Then ask away here or in the multitudinous methods you have open to you. Or hold onto it for the day and drop it like a question bomb. Yes. Since I found out the planet was a sphere and the sun shone on it at different times, life has been a wholly more complicated place. For me to run one of these for those in the "+" timezones requires a little bit more planning because it means morning in UK time. With a small child obliterating the house, that requires a little more planning and backup from The Mrs. It will happen as there are a bunch of RPG authors on the planet's posterior I'm very keen to chat with. No problem. Doubtless there will be more. If you think it's kind of fun to watch, it's 100 times more fun when you're there. Hi Rob - & genuflections to the Glorious Benefactor. I've tried registering at the excellent 1KM1KT forums - as 'Abstract Machine' - but the system can either a) sense my evil or b) feel my urgent need to tell you about the important link between modern kitchen design & Jungian archetypes. It refuses to send me an activation email. Would it help if I promised not to try sell you white goods or granite worktops? I plan to come back view this discussion on YouTube. Thanks, M.
Thanks for your message. Sorry that 1KM1KT activation didn't send, that's annoying as the bots seem to get in ok. ;-) I have activated your account and tested the permission. Please do come and log in! The activation email sometimes gets spam filtered. I have no idea why, the last system email I sent was in 2006!